The five Scrum values (Commitment, Focus, Openness, Respect, and Courage) were mentioned in Book Agile Software Development with Scrum (by Ken Schwaber, Mike Beedle) but the values were not part of official Scrum guide. These were added upon a suggestion by Iain McKenna (Oct 23, 2014) on Scrum guide User Voice. Users have commented and voted it to be part of the Scrum guide 2016.
makes the Scrum guide more clear. On three Scrum pillars (Transparency, Inspection, and Adaptation) these values create a focused and fun to work environment. An environment where teams embrace changes, care and respect each other. More interaction and communication is appreciated. Scrum is considered as a framework for developing and sustaining complex products. The Scrum values act as a heart, pumping fresh blood to the rest of framework and respective processes and methods defined by the team. The team members can use these values as a guiding star to make a decision that benefits individual, team and project toward achieving the common goal. These values, I think are important for a successful implementation of Scrum and make more sense. “When the values of commitment, courage, focus, openness and respect are embodied and lived by the Scrum Team, the Scrum pillars of transparency, inspection, and adaptation come to life and build trust for everyone. The Scrum Team members learn and explore those values as they work with the Scrum events, roles and artifacts. 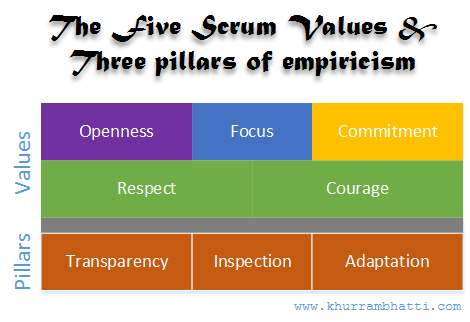 The three pillars (Transparency, Inspection, and Adaptation) acting as a foundation on top of which the five Scrum values empowers the Scrum Team to deliver value. Here is how I have tried to relate it, there can be other relations out there as well and all of the values act in combination as well. I think Courage and Respect act as base values. With Respect, Scrum Team has Courage to share and listen to ideas and experiment with them. With Focus the Scrum Team can avoid distractions and Commit to Sprint goal(s). And with Respect and Courage Scrum Team can be more open to creating an environment fun to work, transparent and value adding. Agile and particularly Scrum as methodologies enables and empowers the team (with responsibility). The purpose of Sprint is to define realistic and clear goals in agreed duration (2-4 weeks). The team commitment is to welcome change and gaining value once the goals have met, in smaller but concrete steps. The team is only committed if they enjoy doing it. As an individual, the commitment would be that I am available to contribute in possible ways to reach sprint goal. Commit to learn and collaborate, commit to scrum values, commit to delivering working software (and others that team would like to commit it). I think commitment should not be taken as a (sprint hard) contract but the defined goal(s) that team would like to work and achieve a value out of it. It is not forced but the collective decision by the Scrum Team. If there is an urgent task to be handled during Sprint then PO, SM and development can decide the next steps together while maintaining the harmony. Life becomes easy when we know what we want to do first and where to put all energy in an organized way. Once the team has defined Sprint goal(s) and committed, it helps the individual and team to focus and reduce waste, doing things with less value adding. Product Owner and Scrum Master can guard development team against unnecessary external requests. The product and sprint backlog lists are ordered with clear Definition of Done (DoD) and Definition of Ready (DoR) statement. In Scrum, we are focusing our efforts on just a short duration, a time-boxed (while keeping in mind the goals). The stakeholder Inspects at the end of Sprint and Adapt accordingly – deciding what to do next considering the complex and highly unpredictable software development industry. The Sprint acts as a safety net, where there is less risk than a project where we get the results after 6-12 month, with less time to take corrective actions. In Scrum, there are fewer surprises and more time to fix if things don’t happen according to Sprint goal. In a cross-functional team, an individual has an opportunity to contribute from own perspective. Everyone knows where we are heading and has a voice. It creates a transparent environment and reduces the surprises for team members. The three pillars of empiricism are there to empower the individual and team. The book “This is Lean” (a good read) (by Niklas Modig and Pär Åhlström) explains this concept with a football field. Besides, transparency, as one of the key pillar of Scrum, is important for openness. The product backlog, sprint backlog, road maps, visualization (information radiators) (and etc) are there to share information about where are standing, what are our challenges and where we would like to go. Brilliant ideas can come from anyone working on a project. The retrospective can be one example where the team is open to appreciate the great work completed, sharing information and discuss the possibilities of improvements. The team is open to working in a wider environment with different job description and disciplines. We as human being prefer to work in an environment where we are respected for having different background, expertise, and insights. The cross-functional team has diversity and plays an important role to meet Sprint goal(s). People should not be judged on their experience or personal background. The openness can only be achieved when team members are respected and encouraged to make decisions. The things should be open and not blame each other but rather motivate to contribute and fix. With dysfunctional relation in the team, the goal(s) can’t be met. If one does not respect a person, what ever ideas or comments are contributed by him or her, those will not be appreciated as well. For instance, the development team should be respected for their estimates and trusted the way they would like to do it. The team should respect the decisions made by PO and SM considering the future aspects and understand each other’s perspectives as well. There should be respect for the decisions made internally and externally, the functionality which is built and not built. Agile is all about change and change requires courage, Scrum welcomes changes and manages to best deliver the value. I think Agile/Scrum as just like a laboratory where a team can experiment and learn the ways to best contribute and add value. Scrum is a framework which provides opportunities to develop own procedures and methods (conforming to Scrum) as per project and environment needs. This can only happen when the Scrum Team shows courage to take a step ahead and learn from it. It is about taking risks and trying new things. There are concerns from Management about losing roles and authority and also from Teams at being more agile and reactive. I think courage is fundamental value and a leadership value to be Agile. The Scrum Team should show courage to question and understand the decisions being made. Most important to show courage to not ship a software with less quality or a feature that nobody desired. There are Scrum success stories to appreciate and failed stories to learn from as well. The five Scrum values empower the Scrum team. Providing possibility to contribute more in a constructive way and become a value adding team member.